Students, parents, alumni, faculty, and staff are invited to the School of Arts and Humanities homecoming showcase event--Arts and Humanities on the Hilltop. 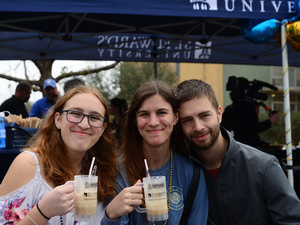 Visit the School's tailgating tables to reminisce with faculty, learn about new programs, and from 12-1pm (or while supplies last) enjoy a free root beer float in a souvenir mug. Free admission. RSVP is encouraged, but not required.